It's 22:49 in Bristol, USA right now. 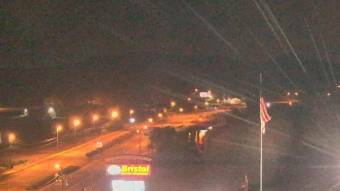 Bristol Motor Speedway A webcam in Bristol, Tennessee - camera location: Bristol Motor Speedway. Abingdon, Virginia: Watauga Elementary School, 14.2 miles away. Bristol, Virginia: Cumberland Square Park, 16.8 miles away. Johnson City, Tennessee: Bank of Tennessee, 21.4 miles away. Johnson City, Tennessee: Buffalo Mountain, 21.4 miles away. Honaker, Virginia: Honaker Elementary School, 31.5 miles away. Blowing Rock, North Carolina: Appalachian Ski Mtn., Inc., 42.5 miles away. Morganton, North Carolina: WBTV Morganton Bureau, 65 miles away. Wytheville, Virginia: Wytheville Community College, 65.1 miles away.